The remarkable story of a British woman who saved hundreds of former war horses has been told in a new biography released nearly 100 years after the close of the First World War. Born in 1883 to an aristocratic Scottish family, Dorothy Brooke was raised with horses and other animals throughout her childhood. 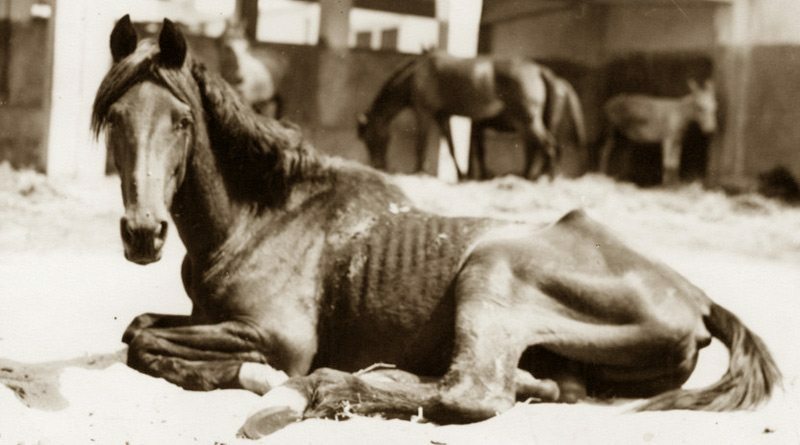 She married Major General Geoffrey Brooke in 1926 and soon after discovered the horrors that former war horses were experiencing in Egypt, when she saw thousands of animals who had been abandoned after World War I. They were now facing a daily life of backbreaking misery and inadequate care. Brooke founded the Old War Horse Memorial Hospital in Cairo to take in and care for the horses that had given so much to the allies during the war. The Brooke charity became the world’s largest international equine welfare charity, and its founder’s story has been told by author Grant Hayter-Menzies in Dorothy Brooke and the Fight to Save Cairo’s Lost War Horses. In addition to raising awareness about the organization’s mission, Hayter-Menzies is pledging 40% of his royalties to Brooke to help sustain Dorothy Brooke’s legacy by improving the lives of working equines around the world. Brooke’s story is told in the book Dorothy Brooke and the Fight to Save Cairo’s Lost War Horses, by Grant Hayter-Menzies. The hardback book also highlights the real challenges of founding and maintaining such a large-scale mission. Through its story, readers come to understand how Brooke’s mission has continued to live on and increase its reach across the world. Dorothy Brooke’s legacy today provides veterinary care, training, and education programs, to improve the welfare of working equines across Asia, Africa, and South America. Last year alone, Brooke reached two million horses, donkeys, and mules, benefiting 12 million people who depend on them. Today, that legacy also includes Brooke USA, the American sister charity of Brooke, headquartered in Kentucky. This year, Brooke USA launched a $1 million fundraising campaign called “Horse Heroes” to honor American WW1 equine heroes and the beginning of the Brooke charity. Dorothy Brooke and the Fight to Save Cairo’s Lost War Horses, includes a foreword by renowned horse trainer Monty Roberts and an introduction by Major General Sir Evelyn Webb-Carter, a retired senior British Army officer and chairman of Brooke. An old war horse taken in by Dorothy Brooke in Egypt. About the author: Grant Hayter-Menzies is the author of several books, including From Stray Dog to World War I Hero: The Paris Terrier Who Joined the First Division (Potomac Books, 2015) and Shadow Woman: The Extraordinary Career of Pauline Benton (McGill-Queen’s University Press, 2013). A resident of Vancouver, British Columbia, He is currently working on a biography of Woo, monkey companion of Canadian artist Emily Carr.